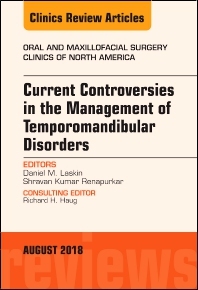 This issue of Oral and Maxillofacial Surgery Clinics of North America focuses on Current Controversies in the Management of Temporomandibular Disorders, and is edited by Drs. Daniel Laskin and Shravan Kumar Renapurkar. Articles will include: The role of imaging in diagnosis of TMJ pathology; The use of synovial fluid analysis for diagnosis of TMJ disorders; The use of occlusal equilibration in the treatment of TMDs; The use of occlusal appliances in the management of TMDs; The efficacy of pharmacologic treatment of TMDs; The use of Botox to treat myofascial pain; Surgical versus non-surgical management of degenerative joint disease; Orthodontics as a treatment for TMD; Orthognathic surgery as a treatment for TMD; Arthroscopy versus arthrocentesis for treating internal derangements; Discectomy versus discoplasty for treating internal derangements; Costochondral graft versus total alloplastic joint for TMJ reconstruction; Injectable agents versus surgery for recurrent TMJ dislocation; Combined or staged TMJ and Orthognathic surgery for patients with internal derangement and a skeletal disharmony; Treatment for idiopathic condylar resorption: Orthognathic surgery versus total TMJ replacement; The role of stress in the etiology of oral parafunction and myofascial pain; and more!